NY Times Review of "The Hemingses of Monticello"
It hasn't been the greatest week for President-elect Obama. It's never easy being president, and these days the transition to that job is fraught as well. We're continuing our series Conversations with America, asking writers and thinkers to talk about transitions of their own, and what should be on the incoming president's mind. 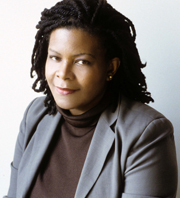 Annette Gordon-Reed is a historian who's written extensively about President Thomas Jefferson's relationship with his slave Sally Hemings. Annette Gordon-Reed: My hometown is Conroe, Texas. I was the first black child to go to a white school in our school district after the court-ordered desegregation. I was in third grade, and I loved to read the biographies that they had at the back of the room. And I read this book about Jefferson, and I thought it was fascinating, because he was a person who loved books as much as I did, a person who was curious about the world. Of course, there is the other side that he was a slaveholder. In the story, there was a slave boy who was Jefferson's companion, who was portrayed as always being mad at Jefferson - "Mars' Tom" is what Jefferson called him - because he wanted to read books. One of my teachers - I'll never forget - she asked the class, "Oh, wouldn't you have loved to live back at this time?" And I said, "No, because I'd be a slave." My replica of Monticello is buried beneath this pile of papers here. And here is a tiny bust of Jefferson that someone gave me. Thomas Jefferson's drafting of the Declaration of Independence was a promise that lots of people - blacks, gays, other people - have taken to heart. It's what we've made of "All men are created equal," and we hold him to a higher standard for that then perhaps we do other people. And in some ways, it's not fair. If Thomas Jefferson came back and saw President-elect Obama, he would obviously be stunned. I don't think he would have been as dismayed as he would have been if Hillary Clinton had been president. I think the gender thing would have thrown him more than the notion of a black leader. I heard the buzz about President-elect Obama before he was on the national stage. We both went to Harvard Law School, and we were both on the Harvard Law Review. He cycled into the school after I did. The first I heard of him was when he became president of the Harvard Law Review - and I can say that, having been on the Law Review, the fact that he became president of that organization is as surprising as him becoming president of the United States. If I could take President Obama anywhere, I would take him to small towns in the South. I would take him to my home town; I would take him to little towns that have been decimated by drug abuse, imprisonment of black men and women, and also lower-class whites, too. You know, when people think of small towns, there's a notion of these bucolic, quaint little places - but there is a lot of quiet desperation going on. Any historian will tell you, we are going to have to wait and see. I mean, I go back to my home town that was pretty much segregated when I grew up. In those days, when we went to the movies, we sat in the balcony. I went to our local clinic, and there was a small black waiting room and a big waiting room for white people. Nowadays, that doesn't exist anymore. But the power relationships in the town are pretty much the same - and the economics. Socially, people get along. I see things I never thought I'd see. I go through Wal-Mart, and I see white women wheeling around their grandchildren - their obviously part-black grandchildren - in the little shopping carts. That would have been unheard of back in the 60s and in the 70s. So my historian sense tells me that something has changed, but we don't know yet how profound it is. I don't think it has yet altered the economic or the social realities about race - that's a tricky business. Things can look as if they've moved very far on the surface, but underneath there are structural problems that still have to be addressed.